I had decided last night, or rather yesterday afternoon, that when I got home I would not be sitting home and watching tv as my husband who works night shift, dozed and snored on the living room floor! I had not been out with my camera in hand for a while, and had to take advantage of the sunny weather and tourist free but still busy flow of traffic. It was my turn to get out, let my hair lash wildly around my face, and tour the shores of Carolina Beach. I had the pleasant opportunity to stroll the boardwalk end of the beach, where there is mini-golf in the warmer season…a pizza shop…tattoo parlor of course, I mean what beach isn’t complete without a tattoo parlor…large hotels, and within walking distance of the marina, boat tours, and a few choice restaurants. It was lovely…and as the black clouds rolled in, I wanted to climb into the lifeguard chair, wrap up in a blanket, aim my camera at the approaching clouds, and roll out some kind of time lapse photography though I’m pretty sure I don’t have that option other than moving sports photos! I’m betting I could capture some serious lightning that way though…that gives me a Hmmm kind of moment! I headed back to my truck though, totally not prepared to brave a storm. No hot chocolate and no blanket, and certainly no protection from the increasing wind. But my goodness, it felt amazing to escape my house and reconnect with nature. The sand was cool and soft..the surf loud and pounding…surfers braving the larger waves dressed in black wet suits, boards ready for the perfect crest…families and kids strolling the beach, some playing a badminton type game, others just strolling. The cool breeze and pending clouds were just what I needed. Upon approaching my truck, a local gent said a quick hello…another passing smile as he headed towards one of my favorite Mexican restaurant. A local smile in what is still a foreign place to me is always such a nice surprise. At the end of each day, I think to myself, where can I go today, what can I do and where can I explore. Despite my best efforts to visit a botanical garden, visit a park, hike outside, or whatever, my heart and truck take me to the beach. Granted, the convenience of the beach beats all the other locations, but I think it is ultimately just a sign that the beach is where I’m supposed to be. In the three months that I have lived in Wilmington, I am drawn repeatedly to the sands and water of the coastal NC line. For whatever reason, it’s as if a magnet draws my soul and takes me along with it…the sound of the surf, the sand sliding beneath my shoes, the birds strolling the beaches, the shells both big and small collecting along the water line. There are not words to describe the sense of inner peace I feel. It sounds a little silly, I know, inner peace on the beach. But have you wondered why computer screen savers are tropical, why sunny days seem less desperate, why the sound of water puts you to sleep, and why the smell of salt water as you approach the beach makes that long miserable line to get in not seem so bad? It’s all connected…you, me, nature! So is it any wonder that my sense of balance seems most even keeled near the ocean? I’m one of those people that approach a beach, breathes in the salt air, then plops down in the sand or finds an empty lifeguard stand to sit up in. I close my eyes, listen to the sounds, take in the salt air, and relax…my body relaxes and my soul is revived. Even in winter, I can wander a beach and despite being cold, leave feeling completely rejuvenated. What I decided though is that since I cannot be at the beach all the time (sadly, my “ship” has not come in as of yet nor have I hit Powerball) that I would begin taking pictures to tide me over (no pun intended) until I’m once again at the water’s edge. 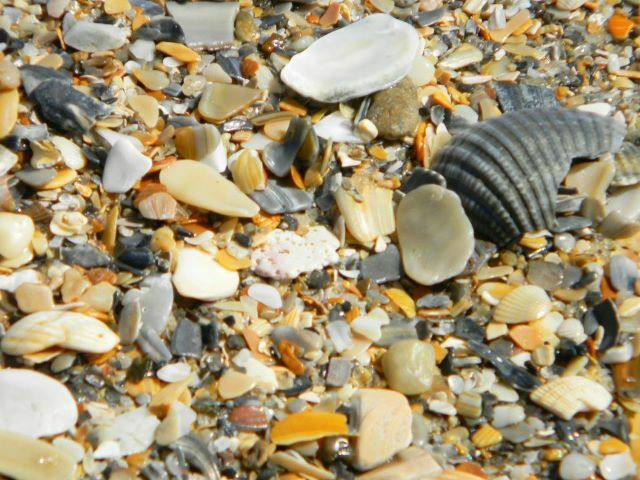 My favorite part of the beach, aside from the water and sand, is the shells…big, small, any color or shape or size. Beautiful and amazing in that nature has created such art then pushed it along a current, dropped it off at our beaches, and left them for us all as gifts. Beachcombing…by far a favorite activity. Ladies and Gentlemen, thank you for taking the time to click on my blog link and read my thoughts, view my pictures, and share my knowledge and experience of Wilmington. Right now, I have been invited to work with a local team of folks in Wilmington, NC to create a site that provides information for locals and visitors; a little bit of everything to include pictures, suggestions, favorites, and even reviews of rules, food, parks, etc. I can’t tell you how excited I am to be involved with this project and am hoping my readers find my information helpful. I will see you all around town…ideas constantly flowing and camera in hand. You never know when you might see yourself amidst a crowd of locals, and I will say hello and give props whenever possible!!! Stay tuned as our adventure and tour of Wilmington, NC begins!! Hey there regular readers, I apologize that its been a stretch since I just sat down and wrote. But I’m writing with stunning and thrilling news that I am overly excited about. You all will notice that a second blog has been added to my site: bentzonwilmington. that is the new link which will go public as part of a travel site here in Wilmington, NC…stories, articles, travel information, rules/ laws/ bylaws, and pictures! I begin my new adventure this week…not only having the opportunity to log my adventure but also to be paid for being a tourist. My gosh, does it get any better than that? It’s a new social site here in our town…and I’m meeting with the creative team tomorrow. Again, so very excited…there aren’t even words to describe the excitement I’m feeling. I have many questions for the creative team, find out the perameters, expectations, etc. I made it over the first hurdle…being selected. Now, I meet with the team to discuss how to officially do this! A small check will support my local adventures…my own hours, my own schedule, following my heart along the beaches, walking amidst the nature trails, biking through our beautiful parks, and networking to learn more about the city from locals, and providing information for our city visitors! So excited…SO EXCITED!! Feel free to critique and tell me what you think…and on occasion, if applicable, take a poll that I’m hoping to post!! !